The Quinnipiac men’s lacrosse team (4-3, 1-0 MAAC) and the Hartford Hawks (1-7, 1-0 AE) played an overtime thriller at the Quinnipiac Soccer and Lacrosse Stadium in Hamden on Tuesday afternoon that ended with Quinnipiac winning 17-16. The game was back and forth all the way until the end of the fourth quarter. Neither team was able to maintain momentum enough to pull away at any point. The first quarter was chock full of goals as the teams combined for 11 total. Both Quinnipiac’s senior attack Foster Cuomo and Hartford’s senior attack Alex Borja netted hat tricks in the first. Cuomo finished the game with a career-high seven goals in the contest. 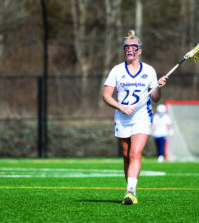 After a back and forth first quarter, Quinnipiac went on a tear during the second, scoring six straight unanswered goals spanning eight minutes and 51 seconds. During its run, Cuomo scored a highlight reel goal by swinging around the crease and slinging the ball with one hand on the stick five-hole past the netminder. Hartford gained some momentum by scoring within two minutes before halftime, making it an 11-8 game. The first half of the third quarter was all about the goalies. Both Quinnipiac’s freshman goaltender Nick DiMucci and Hartford ’s freshman goaltender Cam Logan made some timely saves hoping to keep their team in the game or on top of it. Hartford made several attempts at a comeback in the second half as it shifted its defensive arrangements, trying to slow down the vast amount of scoring attackers for Quinnipiac. 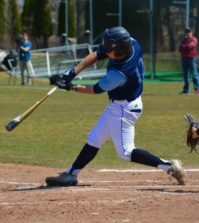 The mid-game adjustment began to work as Hartford clawed its way back from being down 12-8 and then 14-11. Eventually, in the fourth, the Hawks was able to tie the game up at 15 and then take the lead with just over two minutes remaining. Quinnipiac showed some grit and composure as it would not let Hartford steal the game in the last minute. Quinnipiac’s team-leading scorer, sophomore attack Jake Tomsik, scored his first of the game, tying it up nearly thirty seconds after the Hartford leading goal. The teams headed to overtime, which saw Quinnipiac win the faceoff and control the first possession. It drained the shot clock and then Tomsik capped off his clutch performance by wrapping around the crease and sneaking the ball past Logan for the win. Quinnipiac will be facing St. Bonaventure (0-6, 0-3 MAAC) in its next contest this Saturday back at the Quinnipiac Soccer and Lacrosse Stadium.